Sharpening gouges has been one of the more daunting tasks for me over the years, especially without special jigs that allow for a consistent bevel across the entirety of the curve, and without rounding the sharp corners at either end. Whether for bowl, spindle, fishtail, spoon, or any other sort of outer bevel gouge, this will all be the same. 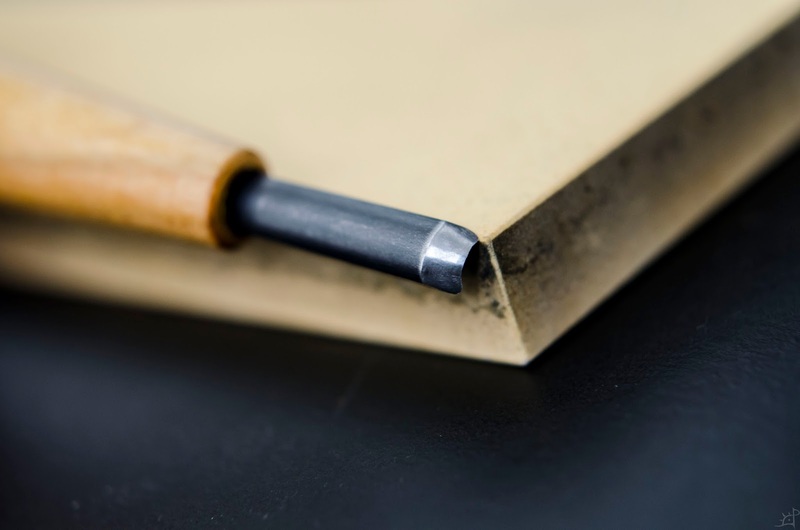 However for inner bevel gouges, I have no experience, and they seem (to me) to be much more difficult to sharpen by hand and without speciality equipment. With a bit of practise and a few tricks, I have found a method that works well for me, although there are a few things that will make this easier. These chisels, as mentioned previously, are exceptionally hard. 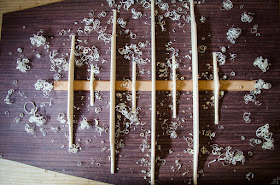 Softer chisels will still benefit from this method, although require a little more care in dealing with the burr. That being said, the hardness makes this both easy and difficult for different reasons. For the worse, they tend to chip very easily, the gouges more than straight and skew chisels. 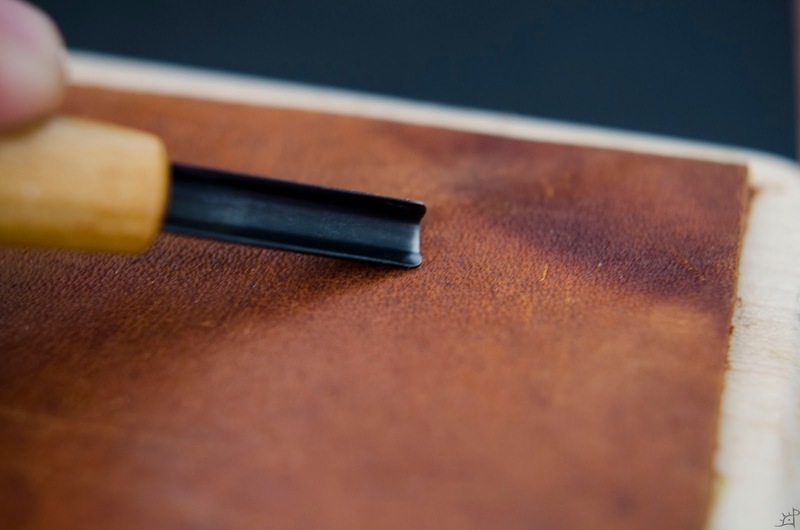 Because of this, the sharpening may take a far longer amount of time as it is necessary to take the entire edge back to the deepest chip. 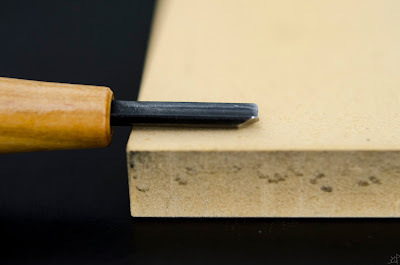 One of the benefits (other than having longer edge retention) is that I am able to use a needle file to push the burr back to the outside of the edge without it cutting into the edge itself, and thus defeating my efforts. Unlike straight and skew chisels, I do not move the edge perpendicular to the stone. Instead, I slide it in line with the edge. To begin, I place the length of the chisel flat against the stone. Since a gouge does not have a large surface to contact at once (only a single tangential line perpendicular to the edge), it is more difficult to perfectly match the angle. On one corner of the gouge, lift up until the edge just touches the stone. It is important to have a little of the gouge body on the stone too, or else you will develop rounded corners (like I have gradually done to this one). Sharp corners are not strictly necessary, but they make it easier to develop crisp lines with the gouge. Holding this angle constant, roll to the same position on the other corner of the chisel as you sharpen it across the length of the stone. To maximize the effectiveness of each stroke, I roll the gouge opposite the direction of my hands (if it were a wheel that rolls freely as you move your hands to the other end of the stone, turn the chisel the other direction). After reaching the end of the stone each time and return to the other side, I check the angle of the edge again to make sure I am not creating a steeper bevel or needlessly polishing the back side without touching the edge. Throughout the process, a burr will begin to form on the inside of the gouge, and obviously a flat surface cannot remove it. 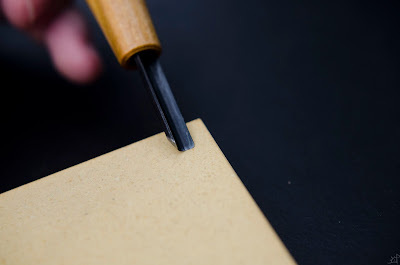 I will demonstrate using a needle file when sharpening a V gouge in a later post. 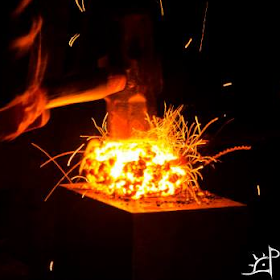 For wider gouges, however, the corner of the stone can be used (assuming it is not a diamond plate which does not have consistent grit on the sides). Ideally, a slipstone that is the same or slightly smaller radius of the gouge should be used, but I do not have any, so this is what I do. Holding one corner of the gouge barely over the face of the stone as shown above. 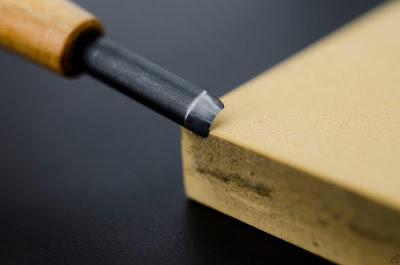 With a very slight pressure (little more than the weight of the chisel), drag it to the other end while rotating the gouge sweep so the opposite corner then contacts the side of the stone. At this point, try to have the chisel as parallel to the stone corner as possible to mitigate the creation of a microbevel. One or two passes at each grit should be all that is necessary to remove the burr. 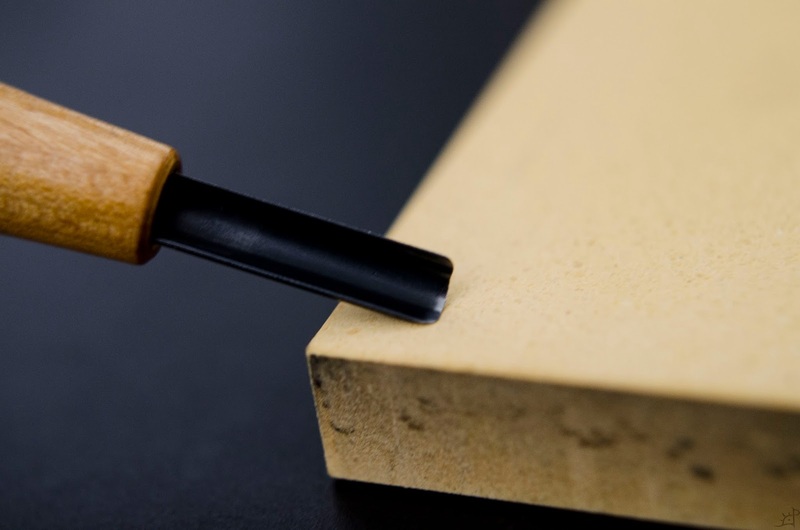 By sharpening parallel to the edge, a smaller burr is formed than how I perpendicularly sharpened straight chisels previously. 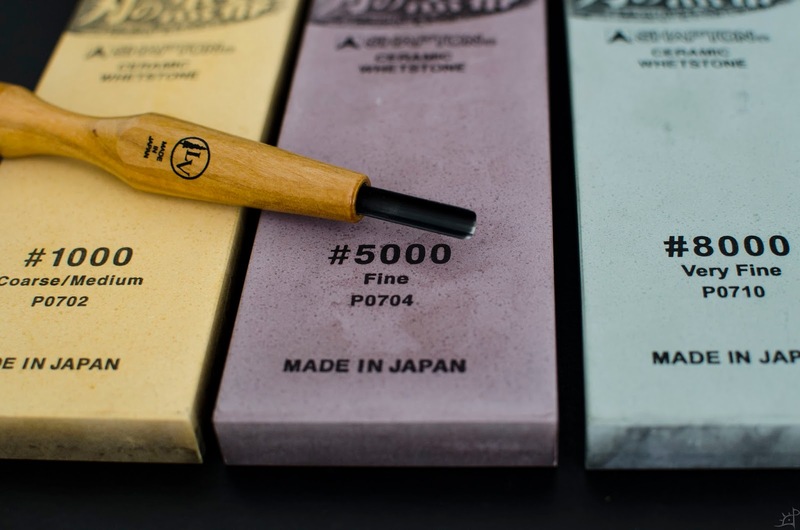 After moving from the lowest to highest grit stones, I turn to the strop. Instead of using the same hand motion, I pull the gouge backwards over the surface, rolling from corner to corner. 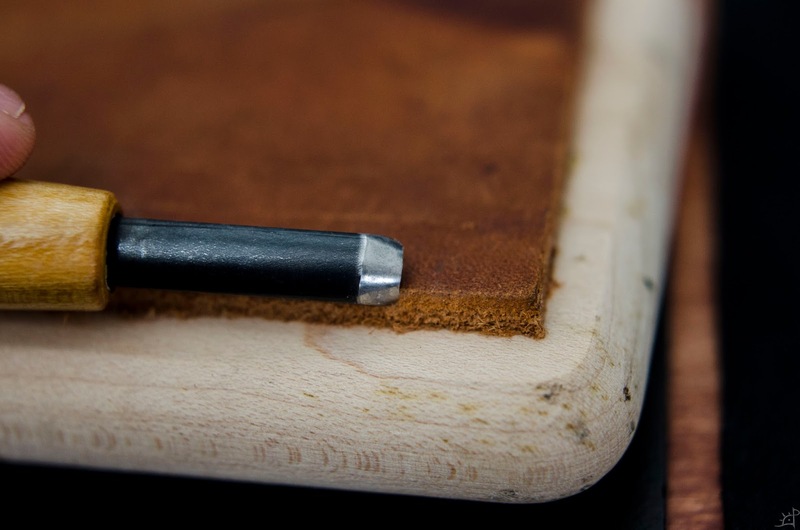 As with the stone, I remove the burr the same way, using the edge of the strop to reach the inner radius in its entirety. That's all. The gouge should be nice and sharp, and if not, return to the highest grit reasonable by the extent of dullness.